Why would one entrust an online doctor to manage their primary care? There are many reasons we at Cirrus Medical Network (CirrusMED) feel that an online primary care physician can benefit you and your health. You will only be assigned an English speaking, U.S. board certified physician, specializing in one of the primary care fields (Internal Medicine, Med/Peds, or Family Medicine). Your Cirrus Medical Network doctor will limit their practice to no more than 400 patients so you can be rest assured you are not just another number. Rather, you will develop a rapport right from the start with an initial "get to know you" virtual visit (by phone, email, or video). More than 90% of conditions seen by a primary care physician in the office can be managed online. We eliminate the "middle man" aka health insurance, so your care is managed by your doctor and NOT your insurance company. It is truly a "win-win" for both doctor and patient! What about just picking my PCP from the list provided by my insurance? or go with word-of-mouth? Certainly you may luck out and find a likable physician either through your insurance plan or word-of-mouth. However, is he available 24/7? Is he booked out for weeks? Is it hard to see him for simple sick visit like a sinus infection or bronchitis? Do you have a hard time finding time away from work to deal with scheduling an appointment, waiting in the waiting room with other ill patients, filling out new medical history and demographic information? All of these hassle factors are minimized by using your Cirrus Medical Network physician for your primary care needs. 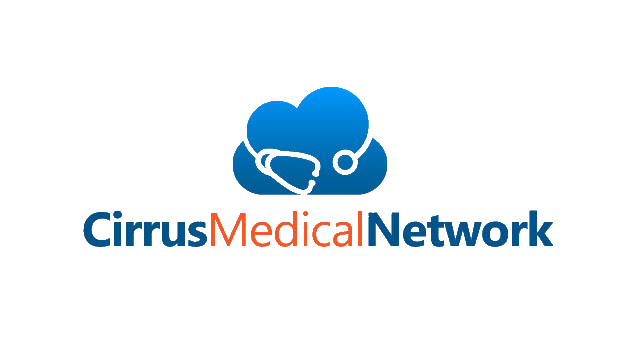 Cirrus Medical Network physicians may electronically prescribe to any U.S. pharmacy. See our prescription policy. What if there is a condition that might need me to be seen in person? You may first run it by your Cirrus Medical Network physician, and if deemed necessary, you may be asked to go to the urgent care or ER for an expedited work-up. Your case and medical records can be faxed to the respective facility in no time so as to minimize medical mistakes. Also, note that for 3 month and annual plans you will receive a "Welcome Package" which includes a blood pressure cuff, pulse oximeter, and a digital thermometer. With these tools your CirrusMED physician can obtain even more information virtually to make an informed decision and may eliminate the need to be seen in person. What about chronic medical problems like high blood pressure, diabetes, or high cholesterol? Most chronic medical conditions, including those mentioned above, can be managed by 1-3 virtual visits a year. You may schedule these out via the online booking calendar. What about consultations, labs and x-rays? Cirrus Medical Network doctors can order labs and x-rays (including CT scans and MRI's) right from our electronic medical record. Patients may be asked to schedule their own appointments and will be provided with the appropriate number if needed. Here's an example of how our members save time and money when an MRI is needed. Referrals to specialists (eg, cardiologist, pulmonologist, gastroenterologist, ENT, etc.) are easily carried out electronically. Generally, once a specialist receives the referral and appropriate paperwork (insurance info, demographics, and chart notes), their office will contact you to schedule the appointment. Can I be reimbursed through my Health Savings Account (HSA), Flex Spending Account (FSA), section 125, etc. for the membership fee? Cirrus Medical Network services are typically eligible as a health care expenses through these programs. However, it is advised that you confirm eligibility with your individual plan. Cirrus Medical Network does not imply, nor guarantee HSA/FSA, etc. coverage and/or reimbursement for services rendered. What imaging studies (MRI, CT scans, ultrasounds, x-rays) will we NOT order? We do not order CARDIAC or HEART MRI's, ultrasounds, CT Scans (e.g. coronary calcium scoring). These need to directed by a cardiologist. If you are having chest pain or suspect heart issues, please contact your local physician, ER, or a cardiologist. MRI's of the abdomen are under most circumstances NOT the best test to evaluated abdominal conditions (exceptions being the liver/bile system and pancreas). What prescriptions will we NOT write? Do you treat hormonal imbalance? No. We do not evaluate or treat hormonal imbalance. We do not prescribe bio-identical hormones. We do not prescribe testosterone or compound creams. We do not provide transgender hormone therapy. We do treat post-menopausal women who need estrogen replacement therapy.